Wonderful Team Member Award III. Publicat pe 22 aprilie 2014	de Cristi M.
My friend, Vijay Shah from Half-Eaten Mind nominated me for the Wonderful Team Member Award. Thank you so much, always it is an honor to be nominated for an award. 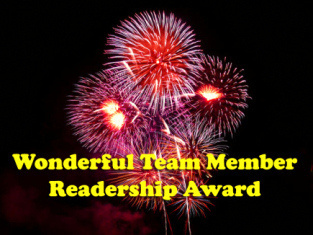 1) The nominee shall display the Wonderful Team Member Readership Award logo on his/her blog. DONE. And if you follow this blog you know my rule : everybody is nominated for this award! Have a nice day! Acest articol a fost publicat în Awards și etichetat awards, blog awards, team award, wondeful team member award, wordpress, wordpress award. Pune un semn de carte cu legătura permanentă. 6 răspunsuri la Wonderful Team Member Award III. Thanks so much for accepting this award and for your wonderful write-up. Keep up the good work, dear friend! !